Always on the hunt for a good book, so when the cover of this book drew me in in Chapters I knew I had to have it. Luckly I have a wonderful Mother who bought it for me as a birthday present I considered myself a very lucky girl and was over the moon. Not only is the author of this book Canadian, she also has a strong voice and smooth writing skills. Plus its short listed for the 2010 Man Booker Prize. Although the story has a sad premise I was mesmerized by the story and finished it in tewo day. It is narated by Jack and five year old boy who is held captive with his mom in one room his entire life. To him the room is the whole world, nothing exists outside of it. Even the news is pretend, things that just happen in T.V. world. 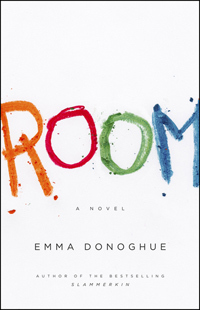 Emma Donoghue, show the strenth of his mother, and the nieve will of a child in a horrible situation, this is book that I truely loved!!! !